Somewhere along the line the word pop-punk turned into a criticism as opposed to a description. These days, I feel like if you call a band pop punk you're somehow insinuating that you shouldn't be taking their music seriously. It seems a bit silly to me as I've been know to take pop punk pretty seriously myself. You should feel totally fine calling Lawsuit Models an awesome pop punk band and know that the band should take that as a compliment. These guys have put two songs down on this 7" that take me right back to 1995. You want a catchy hooks? Both songs have them. Want some of that palm muted, chugga-chugga, start/stop guitar work? That's here too. Octaves and guitar leads? Check and check. 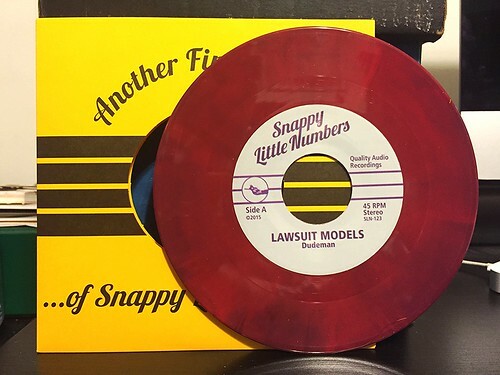 You could just run down the list of everything that makes for a great punked out pop song and Lawsuit Models always seem to fit the bill. Vocally, they remind me of a slightly smoother Paddy from Dillinger Four, though the songs in general are more upbeat and lean towards that 90's West Coast sound. Snappy Little Numbers has done it again. They always send me records by bands I have never heard of and miraculously they're always good. Very few labels have that kind of track record. I really dig this 7" and I'm hopeful the band is already hard at work mixing up some more pop punk greatness. Although I absolutely love Lawsuit Models, I may have to disagree with your description of their sound. They embody more of a late 1990s-2000s Midwest punk sound in the vein of Alkaline Trio, The Copyrights, The Lawrence Arms, and also a little bit of a New York punk sound in the vein of Latterman. They don't have any double-time songs, which is more of a west coast punk sound. I was thinking more along the lines of Cringer/Crimpshrine/J Church west coast sound more than the Fat Wreck thing that I believe you are talking about. I probably should have been more specific.